On December 15, 2105, Israeli security firm Check Point, informed the e-commerce giant, eBay about an online sales platform vulnerability. 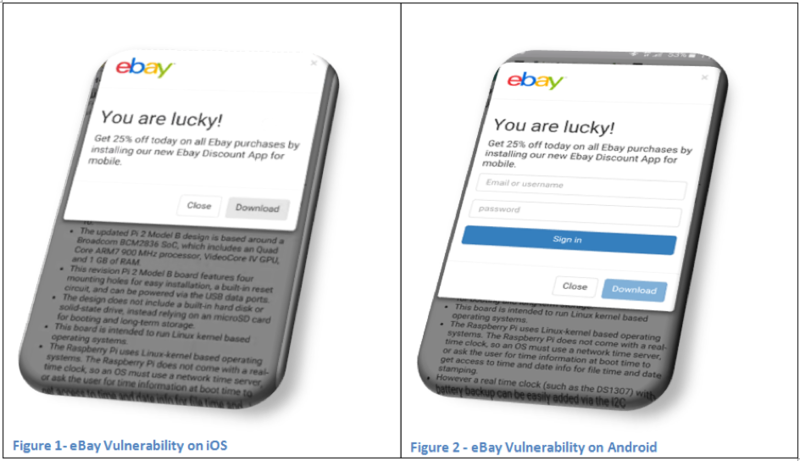 This flaw would allow cyber criminals to distribute phishing attacks and deploy malicious code on eBay’s users. On February 2, 2016 after demonstrating that the hackers could bypass eBay’s security initiatives, Check Point went public with the information, as eBay claimed there are no immediate plans to fix the issue. The attackers would create an online eBay store and implement a technique called “JSF**k” that uses parts of Java Script. In the store, they would create a maliciously written description using 6 limited and reduced characters: “ () +!”, since eBay filters out HTML tags by alpha-numerically striping the characters. While this prevents users from including scripts, it allows the attackers to insert this controllable script that could show up as a message to users. The vulnerability message would appear similar to the images below. Acting on eBay’s website application, the goal was to entice a user to download this new mobile through advertising a one-time discount offer. As soon as the user clicks the download message, simultaneously a malicious application would be downloading on their mobile device. Another potential way to access private information is though a Gmail or Facebook pop-up requiring a user to input their username and password.